Commission work by Trinh Mai. It has become a joyful co-creative experience and a true honor to help clients narrate their stories, honor their loved ones, and exalt the very important things in their lives - an important reminder of what beautiful experiences and remarkable things can come about when we work together wholeheartedly. I have learned to embrace commissions as collaborations, and I have been exceedingly blessed with clients who have given me complete liberty to translate the stories they've shared and the inspiration we've gathered into whichever method, medium, and imagery resonates most organically with me. It has become a joyful co-creative experience and a true honor to help clients narrate their stories, honor their loved ones, and exalt the very important things in their lives - an important reminder of what beautiful experiences and remarkable things can come about when we work together wholeheartedly. My most sincere thanks to those who have offered me a glimpse into their lives and those who have given me an opportunity to transcribe these special moments and memories into the language in which I am most fluent. In the collection of members of the Lamm Family, Portola Valley, CA; San Jose, CA; Rolesville, NC; St. Louis, MO. The Vietnamese word, nước, means both water and country. Inspired by the waters that carried the Vietnamese diaspora to the places that we have called home, and the country from which our roots run deeply, I’ve incorporated both water gathered from the skies of Vietnam and earth gathered from her shores to represent the landlines and rivers that carry the Lamm family’s legacy. The multiple waterways that describe the chronology of each family member’s life course converge to create the river that flows overhead. 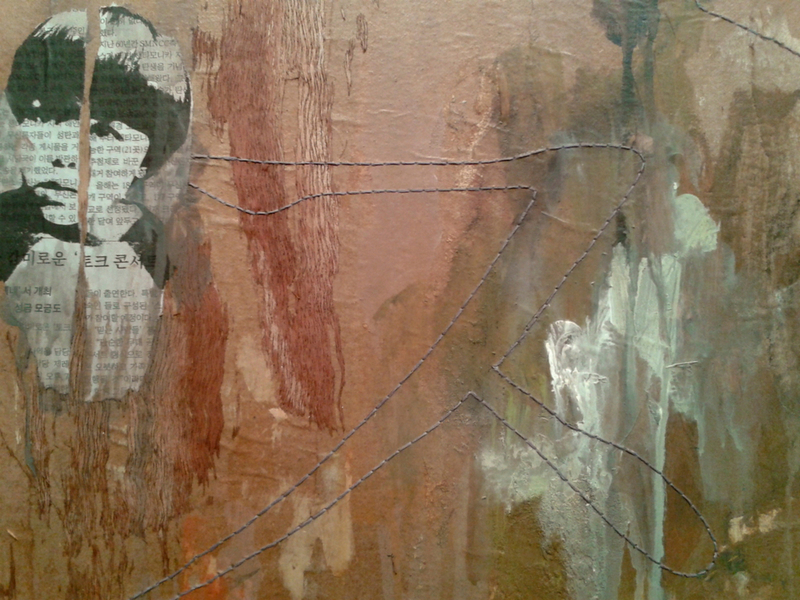 The waterlines and landlines flow from one panel into the next. While this quadriptych tells the story of the family’s journey, each individual panel holds their individual narratives. For more details on their trajectory, click on the thumbnails and scroll over the images for each individual statement. The jars preserve memories from the family archive, and also carry the pothos plants which have been clipped from the same mother plant. And although living apart, they grow steadily together still, with roots exposed as a reminder of their history. Native to Orange County and adorned with UC Irvine’s blue and gold, the American yellow warbler, American goldfinch, and California scrub jay find shelter under a canopy of eucalyptus. Belonging to same class, but different families in the animal kingdom, these birds symbolize the university’s commitment to excellence through diversity. Thirty-three leaves loom overhead, representing the thirty-three species of eucalyptus that have taken root on anteater soil. The wingèd creatures gather around the nest, an ever-expanding place of incubation, nourishment, and growth. The scrub jay perches, calling forth a mist that carries the names of our Lauds & Laurels recipients. The goldfinch observes knowingly. For years, she’s circled the campus and has borne witness to all has been accomplished here. The yellow warbler soars from Langson Library, a sanctuary wherein inspiration abounds and students spend countless hours in pursuit of the knowledge that will prepare them for their forthcoming journey. Inspired by the heart of campus, Aldrich Park, from whose center radiates the concentric circles created by its undergraduate, graduate, and professional schools, the nest is woven from branches that have been collected throughout the verdant groves that dapple campus. The names of our scholars have been burned into each of the 170 branches, each branch representing 1,100 students, to note the 187,000 graduates who will have fledged from UC Irvine by the end of 2017. Their names swirl around the center of the grove, echoing the continuous cyclical nature of our students as they swoop in for nourishment before fluttering out into the world to apply the knowledge that they have gathered during their time here. They take flight, and as natural as migration, the winds await their return. Watch the development of the installation (and my first mural)! When considering the Rising Stars Academy campus, I meditate upon the nourishment, growth, and blossoming our precious youth as they begin taking flight. Sheltered under the walnut and redwood trees that shelter the campus, a small group of children gather in wonder of the world around them. 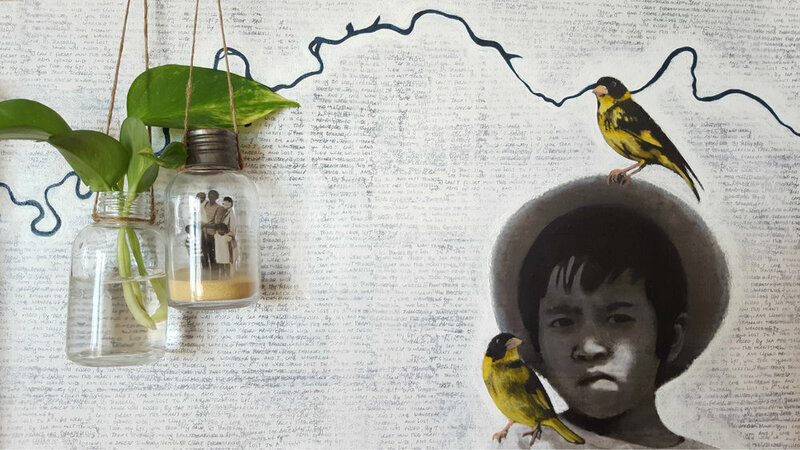 The northern California native goldfinch perches upon the cord from which leaves dangle from above, an auspicious East Indian tradition which brings blessings of prosperity and abundance. The California aster (aster, the Greek word for “star”), finds its place comfortably behind the ear of a child, its petals open to hear and to learn. Throughout Mexico, tiles have traditionally embellished an array of public and private places, including sacred spaces such as churches and homes. 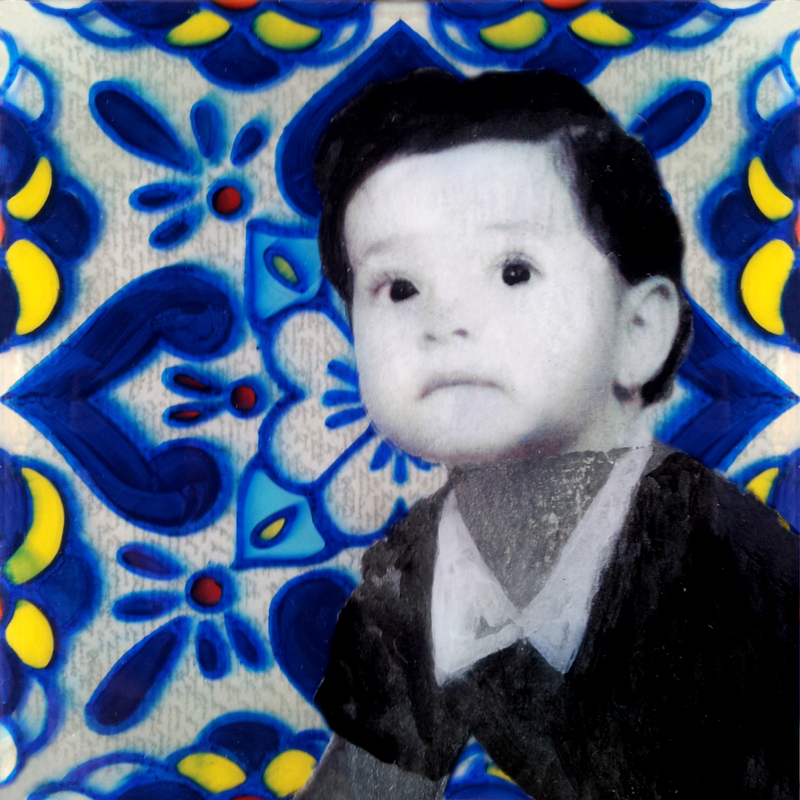 The artistry of Mexican tiles roots back to the late sixteenth century, and like dynamics in the family, the individual clay tiles can come together, creating a motif of heritage and tradition. This altarpiece pays tribute to Maria’s lineage. Each unique tile is hand painted upon a collection of handwritten letters that Maria’s abuelita lovingly wrote to her. For this series of portraits, I asked Cô Kim Anh to write letters to her daughter and each of her grandchildren. These love letters were then printed onto papyrus, preserving them under the children’s portraits. Papyrus has been known to preserve its contents which date back to as far as 5,000 years, paralleling the long lasting love that this grandmother has for her descendants. The children are sheltered by plants in the company of winged creatures. These pieces were made in prayer for the children’s protection, their nourishment, and their growth throughout Life’s journey. Scroll over the portraits to learn more about each individual piece. A tender moment is shared between brothers as they find shelter under a tree. With palms to their reflections, they embrace the sanctity of a rainy day. Above them, a cloudy haze envelops this tranquil scene, a fog created by the children’s own handwriting. To prepare for this painting, I asked the boys to write some of their mother’s favorite quotes from The Little Prince, written by Antoine de Saint-Exupéry, which their parents frequently read to them during childhood. I embedded their writings into the painting, as notes written to their future selves of sorts, a reminder of some of life’s important details. I wonder whether the stars are set alight in heaven so that one day each one of us may find his own. The thing that is important is the thing that is not seen. One sees clearly only with the heart. Anything essential is invisible to the eyes. Only the children know what they are looking for. 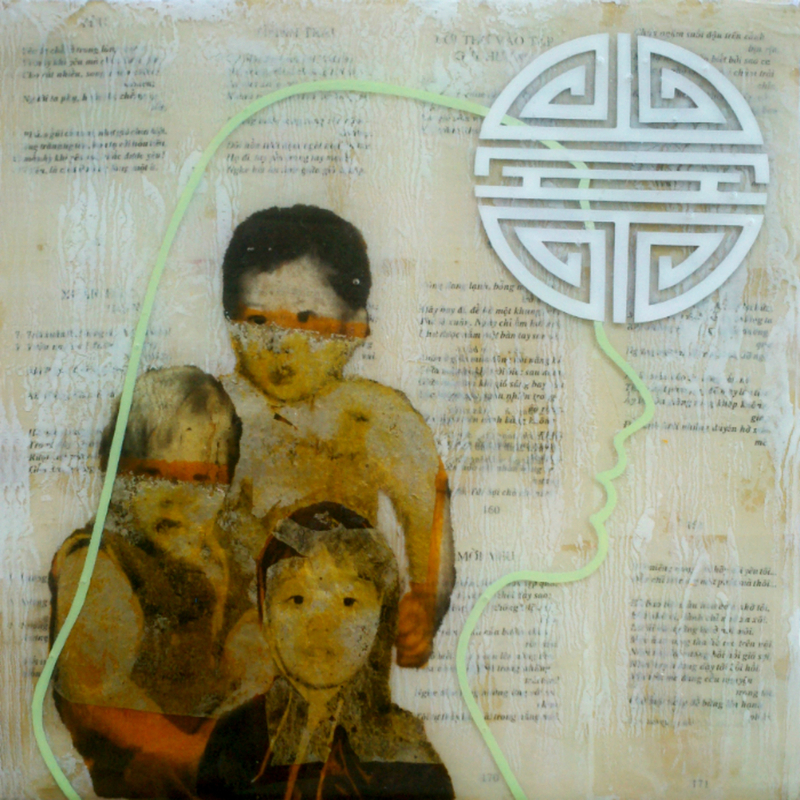 Originally, I had only planned to create a painting for the family, but after learning that their mother had been born in Saigon, I found it important to somehow incorporate the children’s Vietnamese heritage. When I asked about her childhood memories, she recalled collecting worms in jars with her siblings on the rain-soaked streets of Vietnam. Inspired by the idea, I decided to create a supplemental installation which encapsulates some of the family’s childhood photos into little jars. These pieces combine materials collected from both eastern and western shores. Here, the family members stand on Vietnamese ground, the sand collected from various areas off the coast of Vietnam. The corks have been handcrafted from the roots of the succulent plants which grow on the shores of the Pacific, a reminder to cherish our blessèd roots. It has been my honor to have had this door opened unto me, to have had this opportunity and reason to deeply research, gather, ponder, and connect with the traditions and customary rituals of India on such a personal level, and understand them through one of the languages in which I am most fluent. Through sharing stories, reliving history, examining culture, rummaging through albums, and commemorating these tender moments captured through a wealth of photos, this family's generous participation allowed me to create for them a series of works which embodies some of the most significant milestones in their lives, while honoring the people who are closest to them. I began my research by spending time with the family with an open heart and open ears as I (and we) wandered freely through their narratives. For weeks, albums stacked upon the studio table as I foraged through their archives, pulling hundreds of beautiful photos which I felt would help create this visual documentation. Although it was a challenge, I was finally able to narrow the expansive collection down to a couple dozen, which I then combined in order to compile them onto twelve panels. This commission for Judith honors her precious childhood memories of the Fox River Valley of Wisconsin. 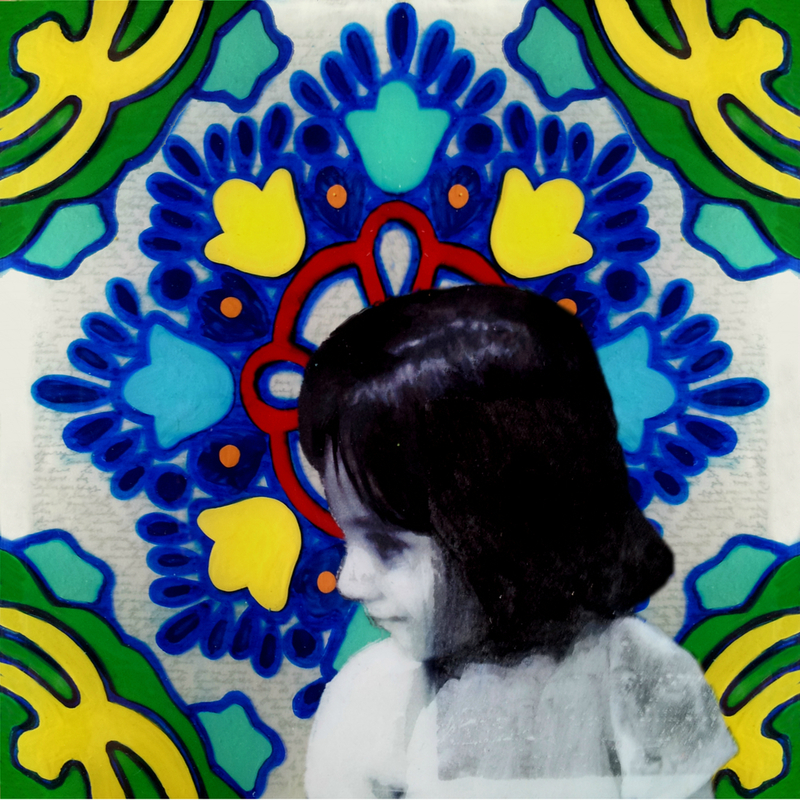 The initial inspiration for this piece sprouted from an image of Judith’s son, a photograph that she took and developed herself. 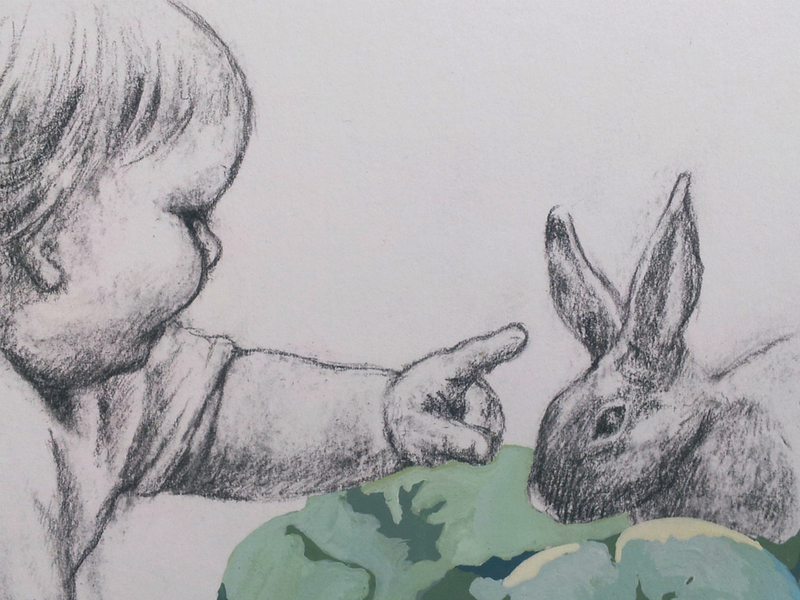 In the original photograph, he engages with a rabbit, an animal that symbolizes abundance, the cycle of life and hearkens to ideals of ancestry. Raised upon a bed of Canadian wild ginger, a native plant of Wisconsin, a young Judith watches her belovèd, as he explores in of the world around him in wonderment. A robin flutters overhead, following the meandering line that is the Fox River. As the state bird of Wisconsin, the American robin brings forth the inception of spring and growth. Commissioned by the San Francisco General Hospital Foundation to create a piece for their annual Heroes & Hearts benefit, I took the opportunity to commemorate San Francisco’s Chinatown, the starting point and home for thousands of Chinese immigrants, and a very important and influential facet in the history and culture of San Francisco. Upon a background of a map from 1885 of San Francisco’s Chinatown, a woman leads her children toward the future into the land of promise and prosperity, and what is to become one of America’s most diverse cities. 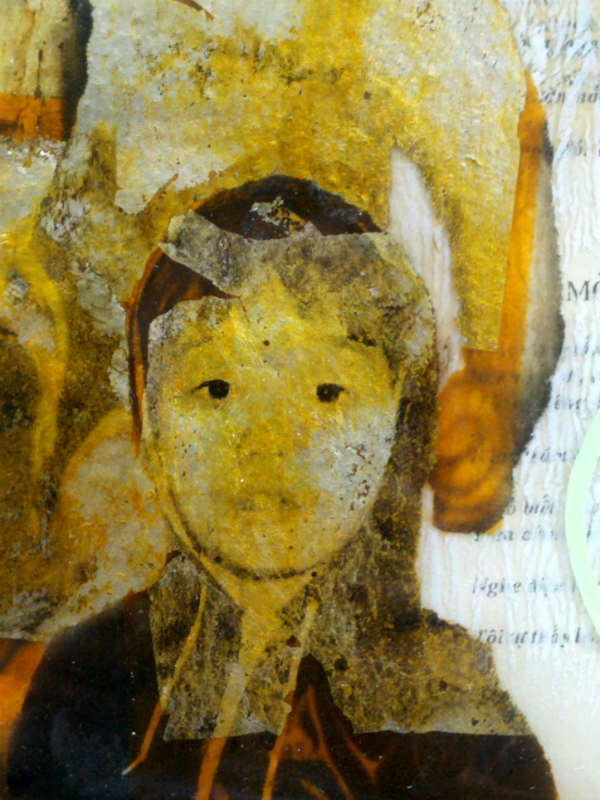 Inspired by photos taken in the early 1900’s by Britton and Rev Photographers and Richard Behrendt of some of San Francisco’s first Chinese immigrants, and with the desire to pay homage to our predecessors, I painted the family upon a halo of joss paper, a rice paper that is burned in Buddhist tradition in prayer for the ancestors. When given absolute freedom, I enjoy working on commissions as they encourage me to step out of my comfort zone by co-creating with the client. Spending time with the client and sometimes visiting their home helps me gain a better sense of who they are, which allows me to gather a more substantial foundation upon which to create our piece. It was a joy for me to work on these portraits of two very bright, beautiful children. 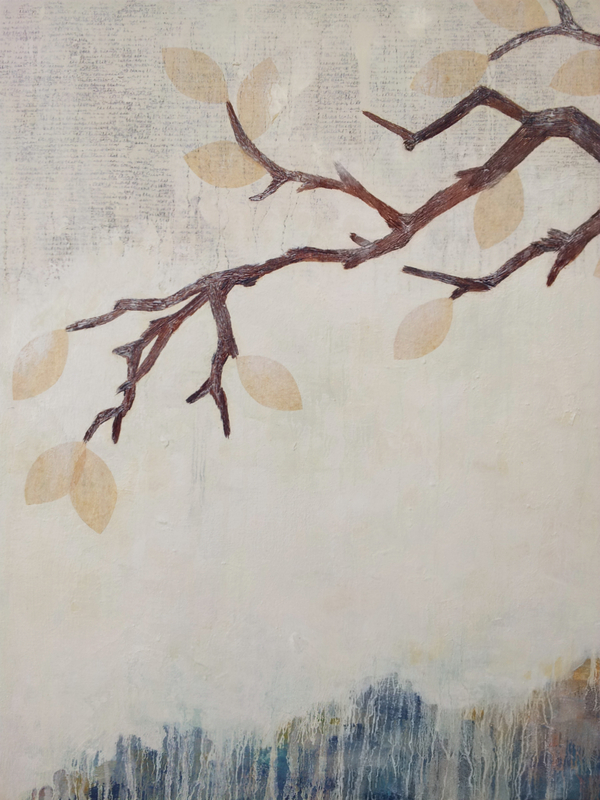 After spending time with the Suhrs and learning of our shared love for the natural world, I decided to incorporate delicate layers of tree bark to represent life and steady growth. 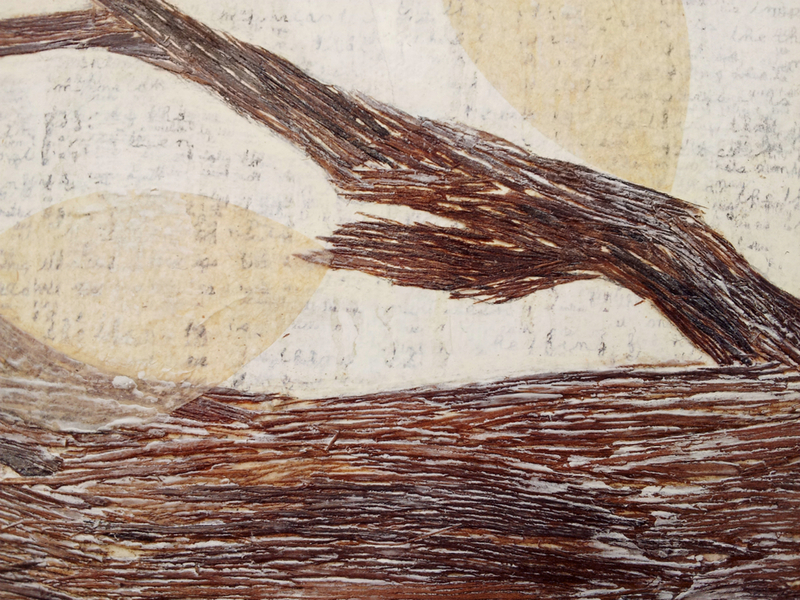 The children’s portraits are painted and printed upon a array of materials, including this tree bark, joss paper and Korean newspaper, while the hand stitching reads “성장” , or “growth” in Han'gul, to honor their Korean heritage. These portraits celebrate youth and continual growth. This is a very special commission piece that I created for a couple’s wedding. They hung these paintings at their wedding, and then gifted a painting to each of their mothers after the ceremony. What a heart-warming idea! 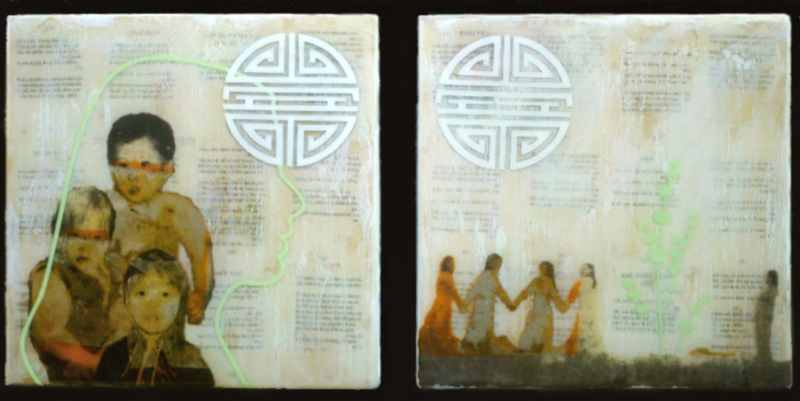 In this diptych, the mothers stand facing each other in one accord. One piece contains the the groom's mother and her three sons, while the other piece holds dear the bride's mother and her four daughters. Vietnamese love poetry serves as a foundation upon which these pieces were developed, while the Chinese symbol for "longevity" hovers overhead. Wishing you two as many blessings as you can ever hope for, for as long as this life and life thereafter may carry you! During a recent conversation with my grandmother, we discussed some of the complex relationships found in honest art – the relationships between artist and concept, artist and subject matter, the relationships between the work of art and the viewer, and therefore between artist and viewer, and the Spirit that draws Life into all of the aforementioned relationships, each playing a pivotal role in the co-creation of the piece. These haunting words found their rhythm into a second portrait of my grandmother, which was commissioned by the same gentleman. Although I referenced the same photo, the face that emerged seemed to be that of my own. I was astonished to see my grandmother’s eyes staring back at me from the past, while simultaneously feeling like I was gazing into a mirror at myself. I am my grandmother’s granddaughter.